There are many choices and options when selecting a general family dentist in Las Vegas. With so many options for the best dentist it can be overwhelming. Do they take your dental insurance, is the dental office easy to get to and which dental services do they offer. All these factors weigh in on your decision for which dentist to choose. The goal for the dentists and team at Perfect Smile Dental is to ensure the selection process is simple. What Kinds of Dentists Should I Look For? Endodontist: Root Canal Specialists – Inside your teeth are tiny cavern-like passages called canals that contain sensitive living tissue, blood vessels, and nerves. Endodontists specialize in diagnosing and treating issues within our tooth. Oral Surgeon: Oral Surgery Specialist – This specialist focuses on treating problems related to the hard and soft tissues of the face, mouth, and jaw. Oral surgeons specialize in treatments that require complex procedures or deep levels of sedation – beyond nitrous oxide or laughing gas. Procedures performed by oral surgeons include tooth extractions, corrective jaw surgery, and cleft lip or cleft palate surgery. Orthodontist: Alignment Specialist – Orthodontics is about correcting teeth and jaws that are out of position uses braces and clear aligners. You may see an orthodontist if your jaw isn’t aligned properly leading to an overbite, underbite or crossbite. You may see an orthodontist if your teeth are crooked or misaligned. 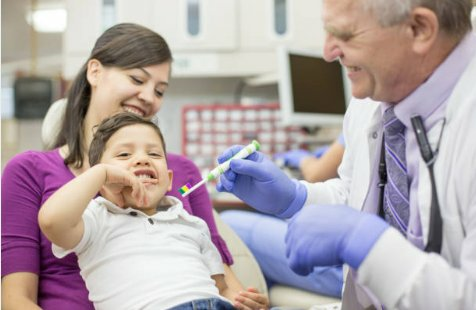 Pediatric Dentist: Children’s Dental Health Specialist – Pediatric dentists are to a child’s oral health like pediatricians are to their overall health. They’re dentists who specialize in the oral development and care of children from infancy through their teens. Pediatric dentists help your child stay on the path to a lifelong, healthy smile. Periodontist: Gum Specialist – Periodontal dentistry focuses on the prevention, diagnosis, and treatment of diseases that affect the gums, and other structures that support the teeth. Think of them as the gum disease experts of dentistry. Prosthodontist: Replacement Specialist – Prosthodontists focus on restoring and replacing lost or damaged teeth. Prosthodontists have a unique understanding of everything that goes into a beautiful, functional, and natural-looking smile. Prosthodontists specialize in porcelain veneers, crowns, dental implants, fixed bridges, dentures, and reconstructive dentistry. Once you’ve determined what skills and specialists you’ll need from your general dentist’s office, you can narrow down to local offices within your insurance plan. For further information into learning about getting the right dentist for your family, contact Perfect Smile. With specialists in multiple fields, we provide a wide range of services and dental care procedures that can restore and maintain any smile.